It took two days to get everything planted. This was, clearly, an eyes bigger than stamina situation. I managed to get one of the flats planted but I just grew too tired to finish. 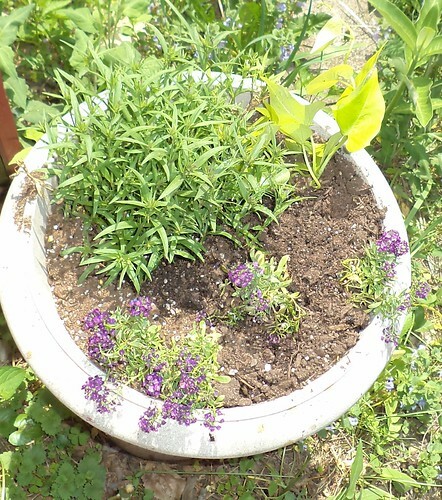 This is the pot at the southwest corner of the deck. This is the one where the dianthus, much to my surprise, overwintered. I added one of the sweet potato vines which will spill over the side during the course of the summer, and 3 dark purple alyssum plants. The dianthus is red so this will be a nice contrast of colors. 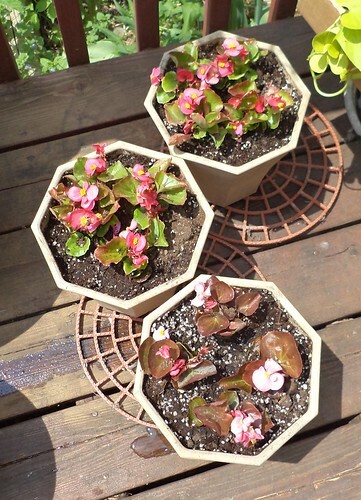 Begonias were potted. 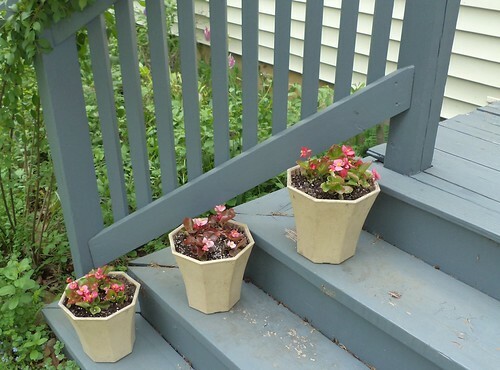 I remembered buying these matching containers specifically for the front steps. Matching! Usually, nothing matches, not that I worry about that at all. An assortment of different pots adds interest, but I thought, years ago, having them all match on the front steps would look better. When I was at mom's in May, she mentioned an article in the paper about impatiens having a blight this year. The article said these flowers, heavily used in shady spots, would be in short supply as the main growers of impatiens had been hard hit. "Begonias," I said to mom. "Just go to begonias this year. There isn't the wide variety of color as there are in impatiens, but they work just as well in shady areas." 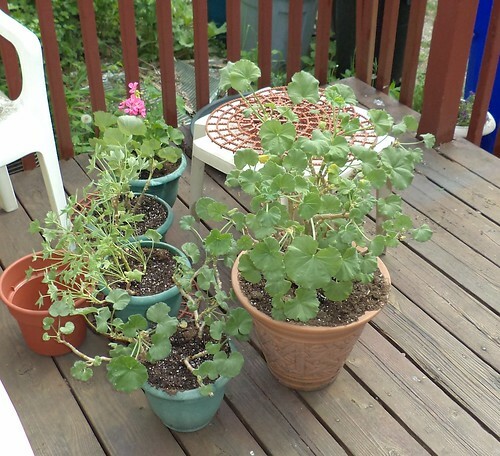 All the geraniums were repotted in fresh soil. One of the things I bought in the winter was a large bag of container potting soil. Supposedly formulated specifically for containers, we'll see how it compares to the pots that have the last of the Miracle Gro potting soil in them. 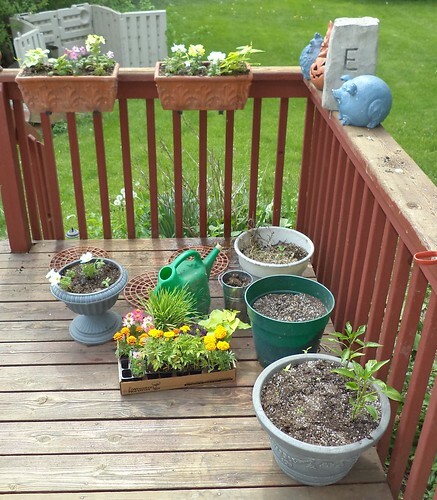 I put all the geraniums in the container soil, removed the old leaves, cut them back a bit and they are ready for summer on the deck. 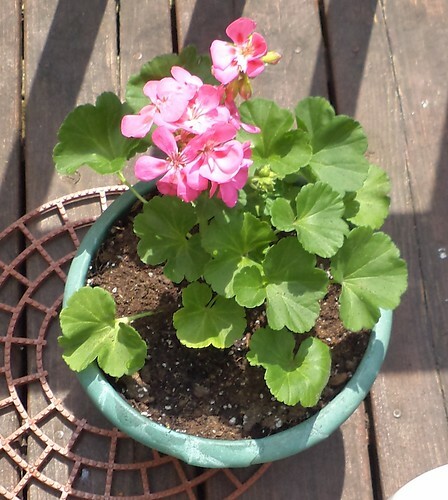 I got a new geranium. This is called "Melody", something I didn't realize until I was repotting it. It has multi-pink flowers. I'm still thinking of going to get one of those dark purple pink geraniums, too. I'm all out of these green pots so, gasp, I'd have to use a different one. 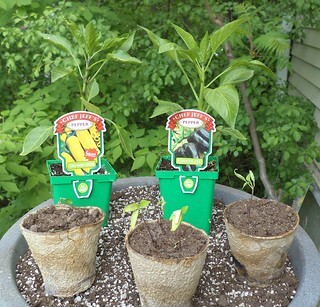 My poor spindly peppers were potted with the hardy, robust peppers I purchased. The orange pepper just isn't going to make it. Overnight, last night, we got heavy rains and this morning, all I could see was this sad, thin plant tipped over in the pot. The other peppers, the chocolate and the lilac (turns red when ripe) were fine and seemed to have adapted very well to being outside and in sunshine. I really like orange peppers so I'm rather sad about the loss of that plant. If I do some running around this weekend, perhaps I can swing by another nursery to see if they have orange peppers and purple geraniums. At the end of the day, this is what was left. I decided to turn the hanging pots to the inside this year. Usually, I put them on the opposite side, but then I don't see them when I'm sitting on the deck. I came inside and washed up. The water ran black from the dirt of potting soil. That's a good feeling. You know you've accomplished something when you're washing your elbows. I sat down to rest before starting the next project, dishes. The next thing I knew, it was 2 hours later and I had Mija in my lap and Pilchard sleeping next to me. Flowers. Cats. Life is good.